This 18th century writing table has Masonic associations. The top left hand drawer is stamped with a symbol of a compass and set square. The one piece highly polished top has a moulded edge and is a deep darkish mahogany colour. The table stands on four turned, carved and part ebonies legs. These are joined by an H stretcher with a beautifully carved finial in the centre. 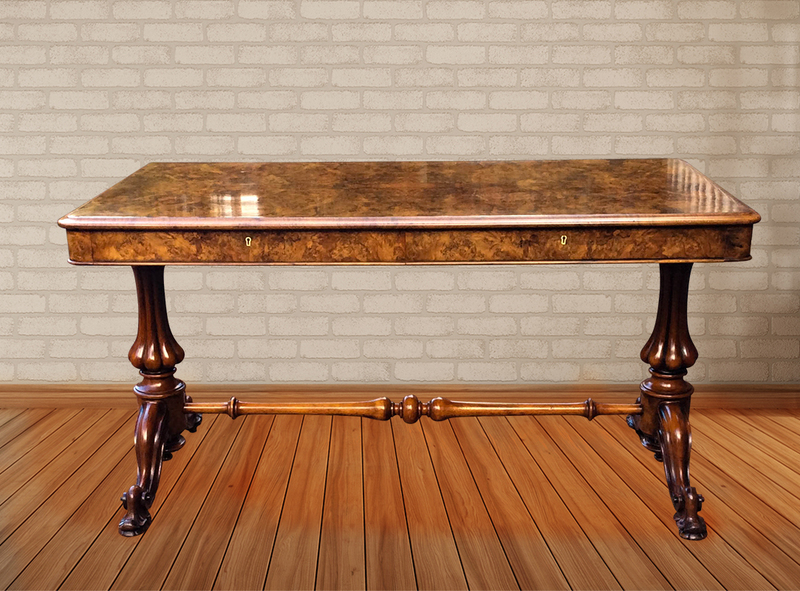 This beautiful antique sofa table or writing table has magnificent ‘book matched’ burr walnut veneers to the top. The top has a ‘thumb moulded’ edge with rounded corners and a shallow frieze fitted with two wide and deep drawers to the front. 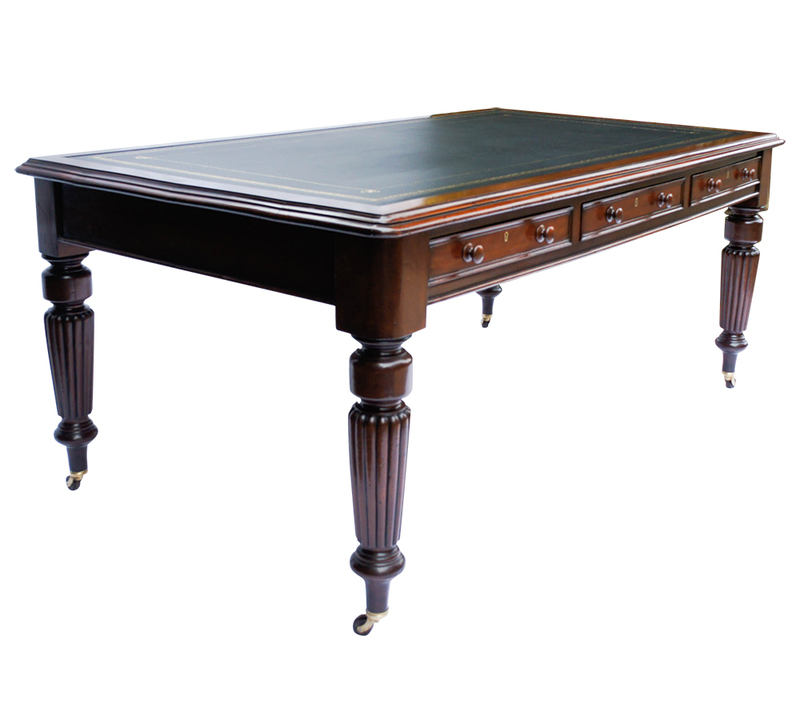 A good quality antique partners library table or desk& constructed from well-figured mahogany timbers. Recently been restored with a replacement black hide writing leather with gilt and blind tooling. 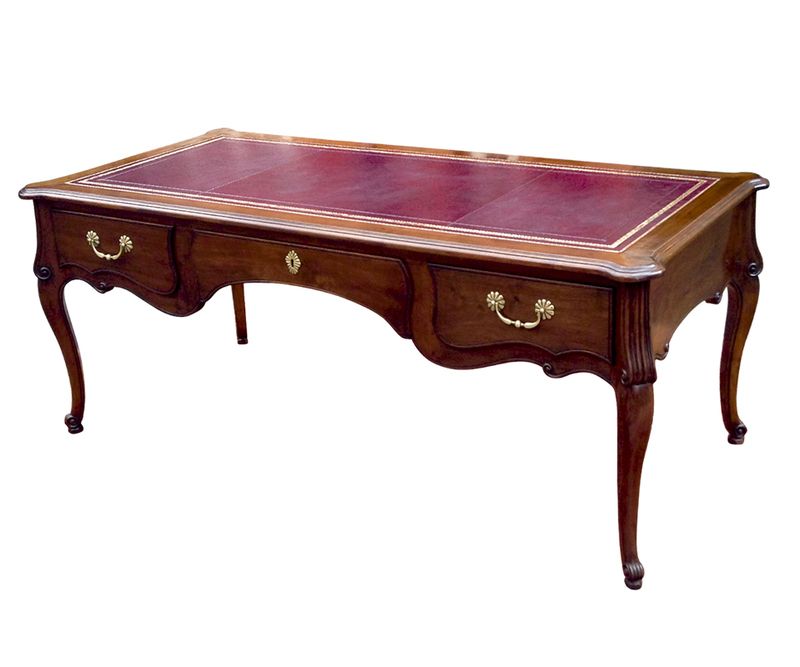 This large, good quality writing table, or writers desk, is in the French provincial style of Louis XV in a dark walnut. 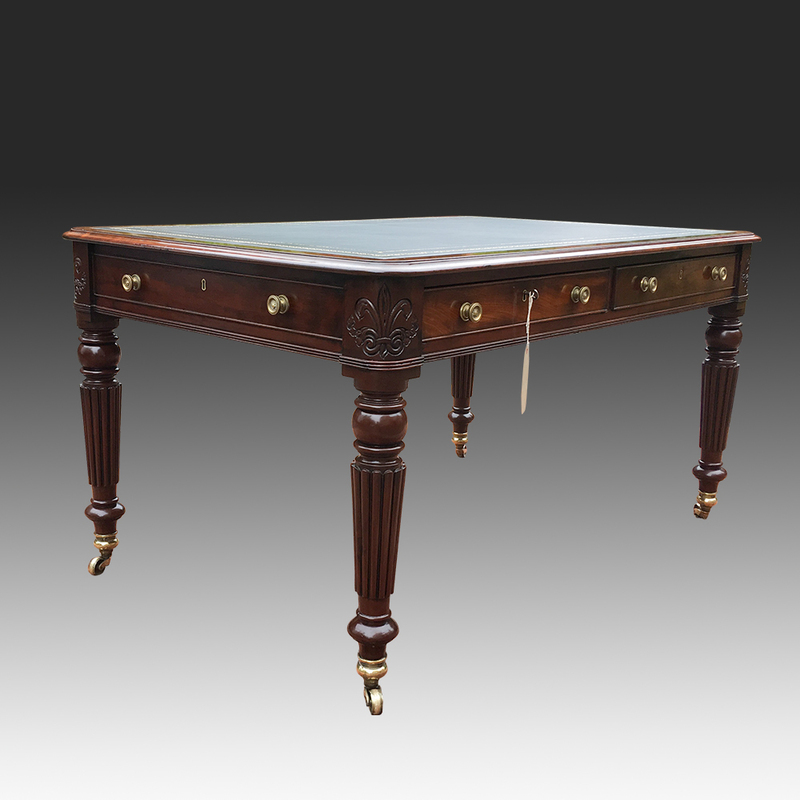 It has been professional cleaned and traditionally restored including french polishing. 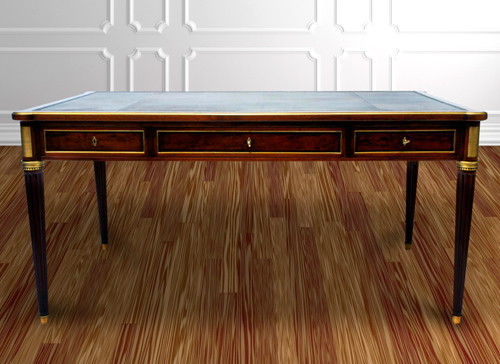 This antique William 1V partners library table or desk is made from the best quality figured mahogany timbers. 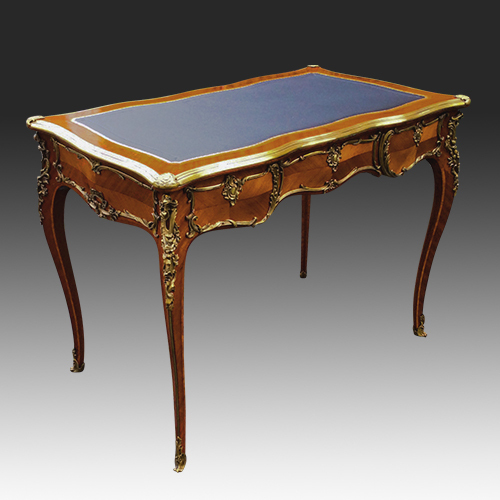 It has recently been fitted with a black hide writing surface with blind and gilt tooling. 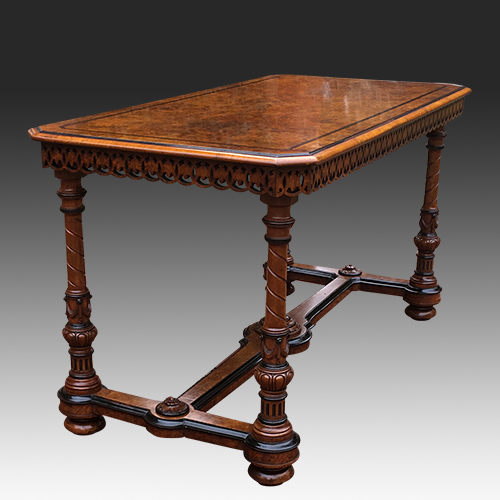 This very good quality Antique William 1V side table or serving table is made from the best quality mahogany timbers in the early 19th-century style of the famous English furniture makers 'Gillows' of Lancaster. 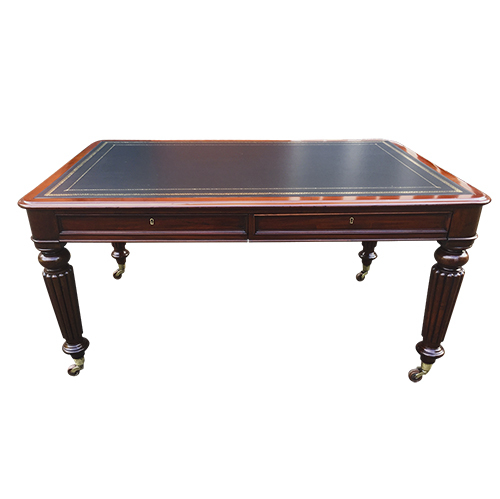 This good quality antique Regency sofa table has well-figured solid mahogany and cross-banded top. The top has a 'bull-nosed edge and drop flaps to either end supported by the original adjustable supports. 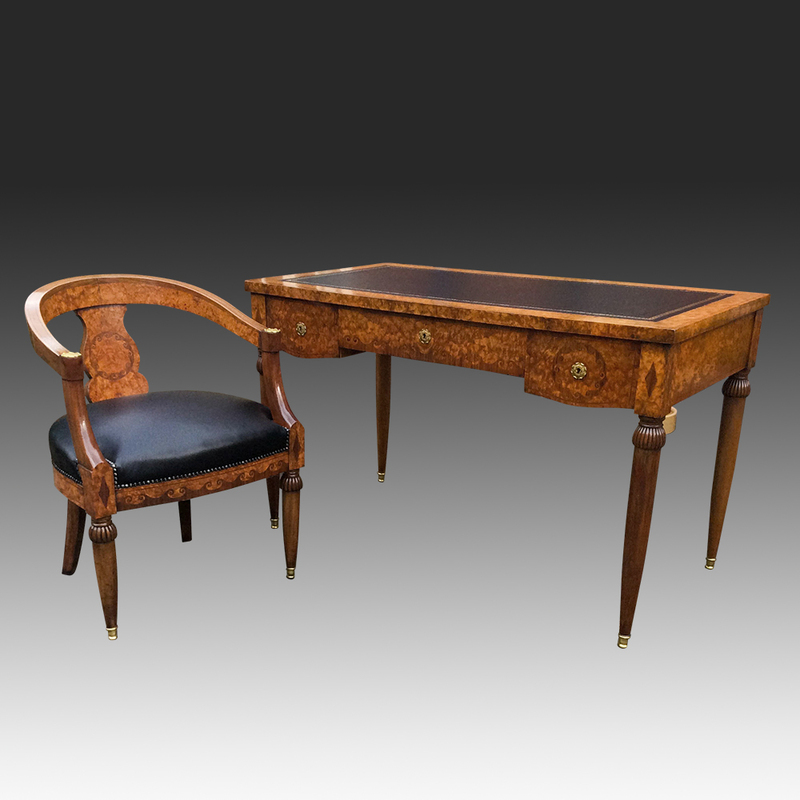 This rare French antique burr and figured walnut writing table and chair have a fabulous golden patina. They have recently been cleaned and polished and are in excellent condition. 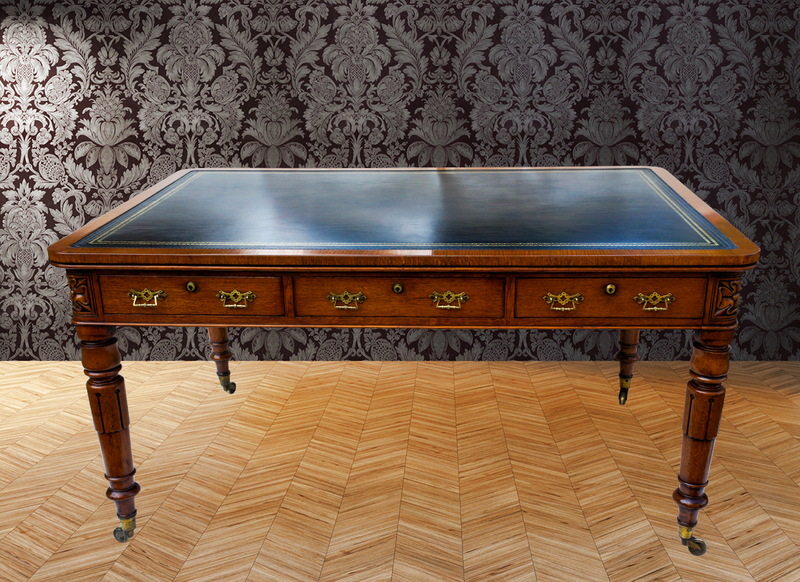 The writing table has a replacement black hide writing surface with gilt and blind scroll tooling. 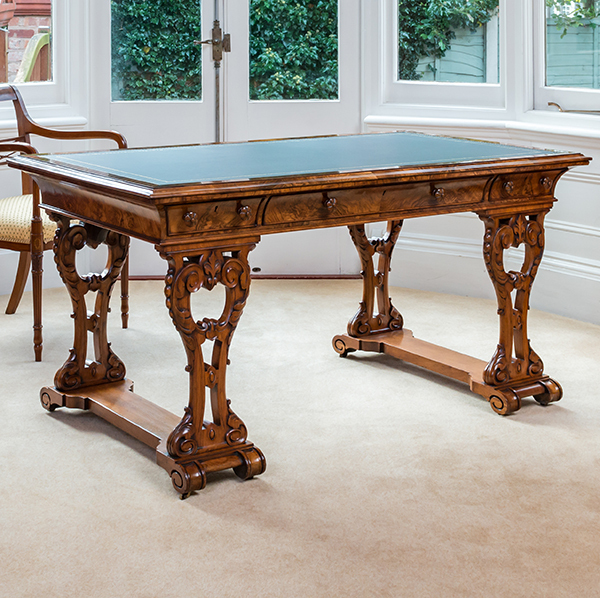 A very rare carved and stunning antique walnut writing table or desk made by Dublin cabinet makers *W F Fry & Co. 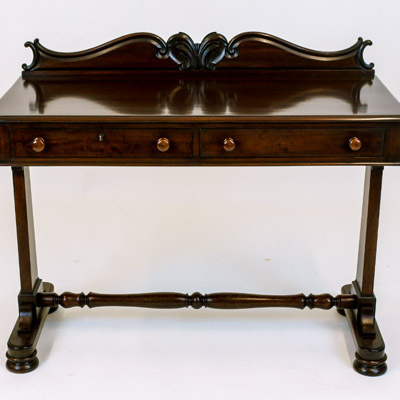 This is a truly stunning piece of furniture with beautifully figured walnut and masterly carving throughout. 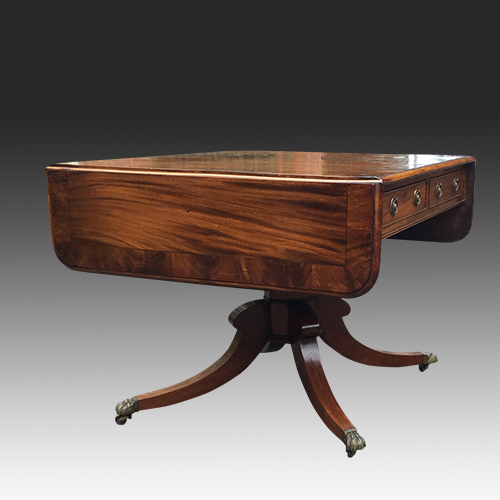 This fine antique writing table or writers desk made from beautifully figured rosewood timbers with a highly polished top. It was made by the famous furniture makers 'Gillows' and is a recognised design of theirs. 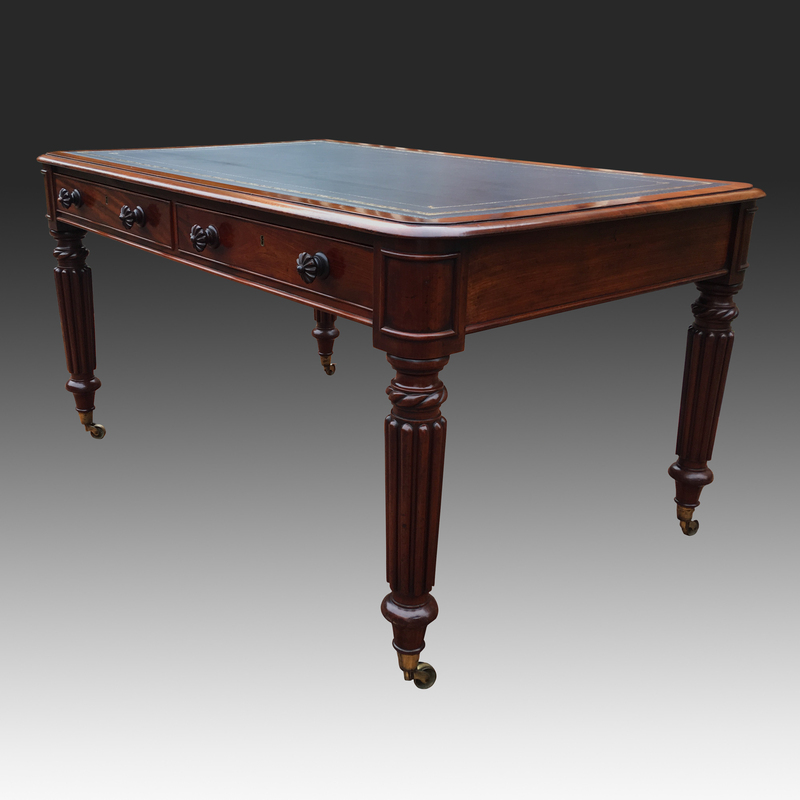 A very good quality, early Victorian, antique mahogany writing table or side table with a beautifully figured top. The top has rounded corners at the front and sides and a bull-nose moulded edge. The back has a low rise edge. 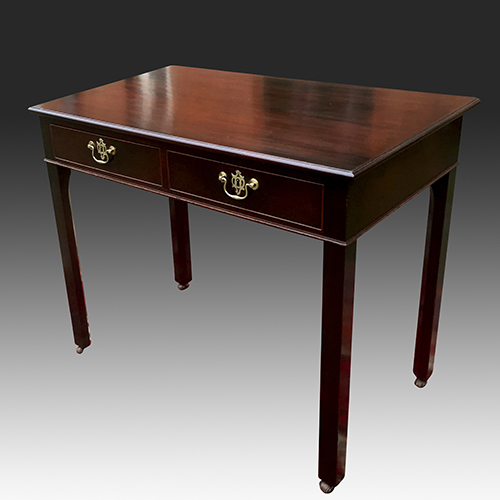 This very good quality antique mahogany side table is made from good quality mahogany. 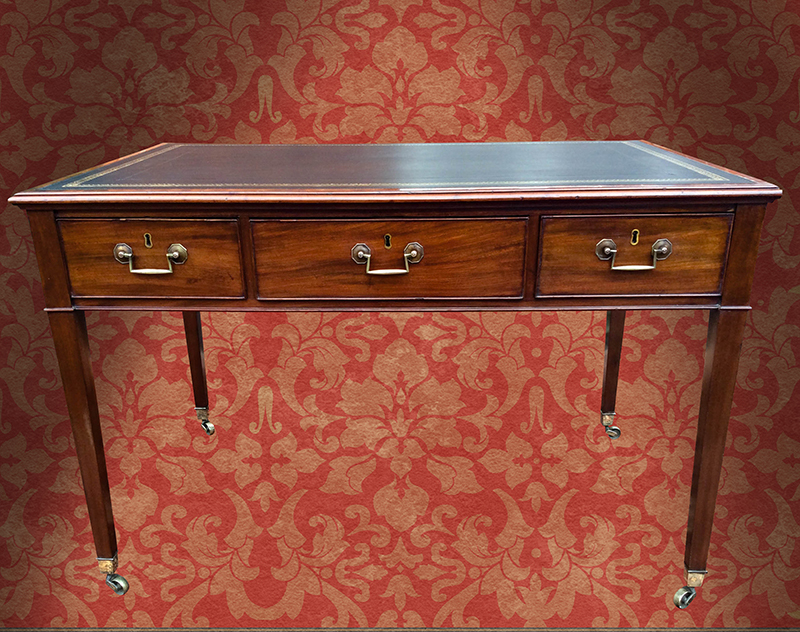 It would make a lovely occasional table or small writing desk in a sitting room. 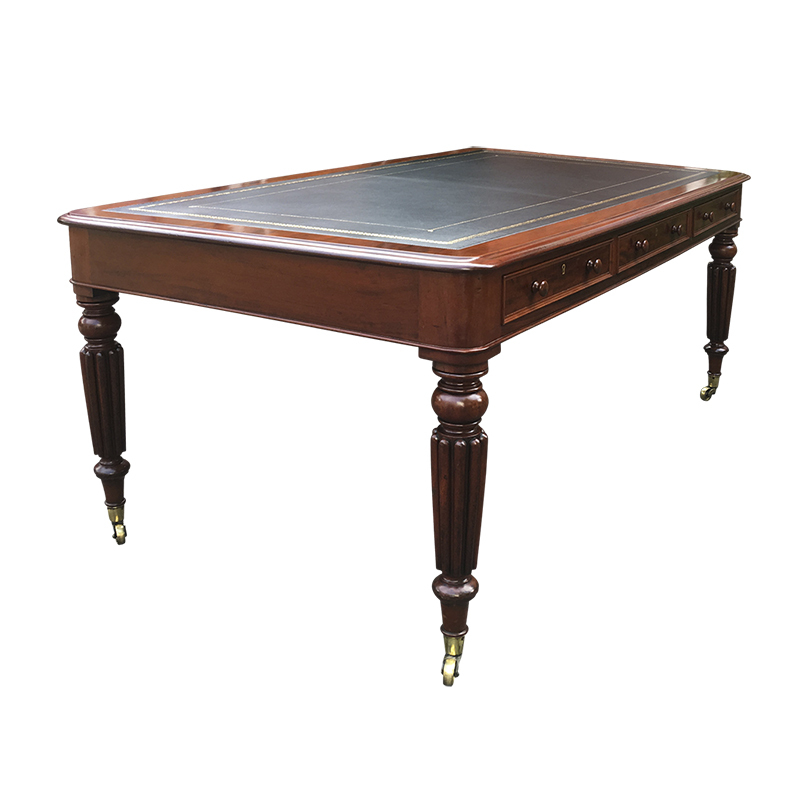 This good quality antique Victorian library table or writing desk is constructed from well-figured mahogany timbers. It has a new black writing leather top with gilt and blind tooling surrounded by a moulded band of Mahogany with a 'bull nosed'moulded edge and rounded corners. 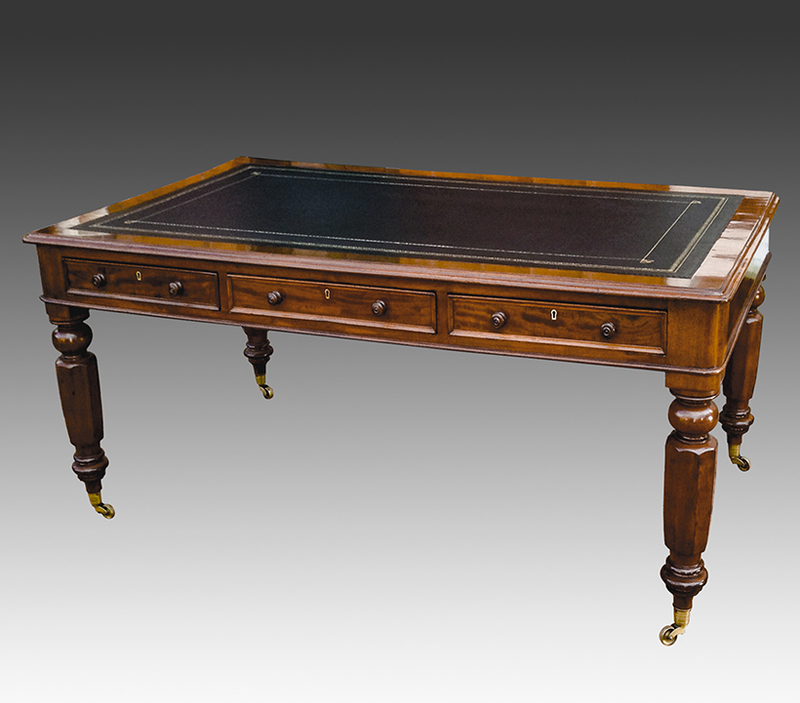 This large antique partners library table or desk has recently been professionally restored including French polishing. It has well-figured timbers and is fitted with a replacement black hide writing surface with gilt and blind tooling. 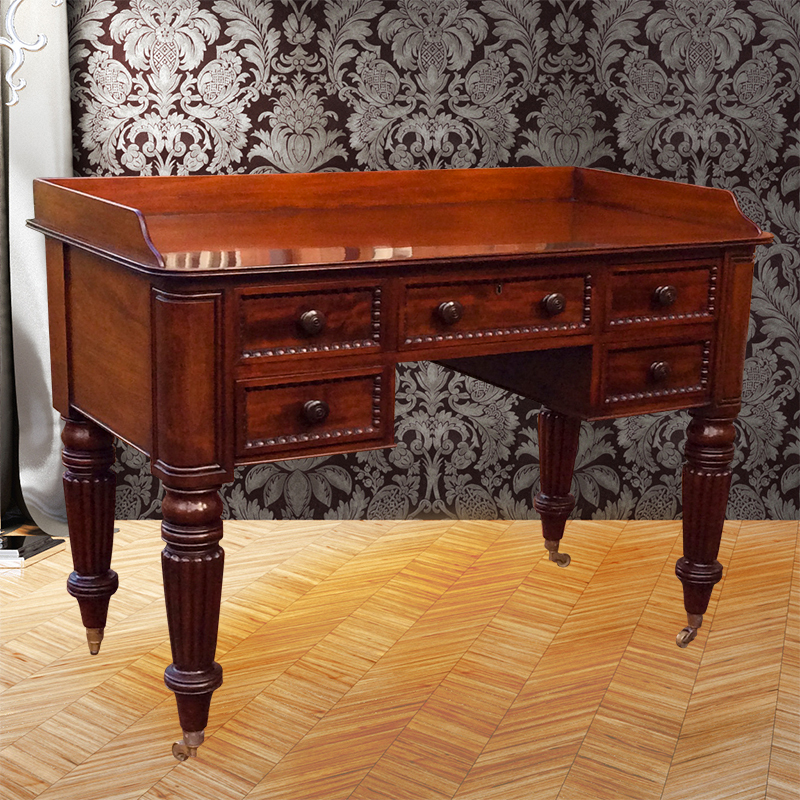 This is surrounded by a band of mahogany with a moulded edge and rounded corners. 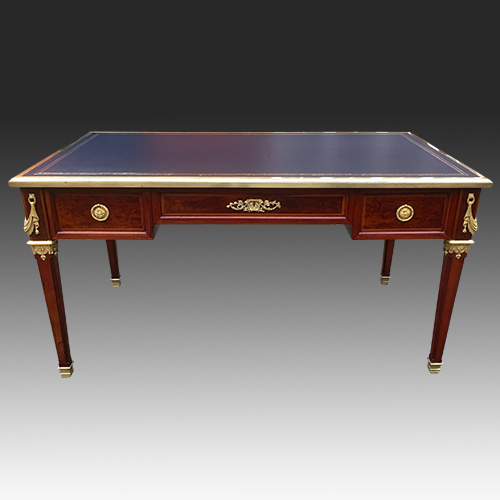 Antique French Empire Style Writing Desk by Kreiger of Paris. 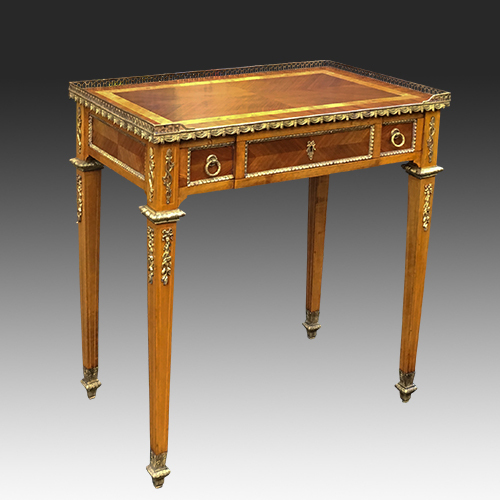 This top quality antique French Empire style writing table or desk was made by the well-regarded cabinet makers Kreiger of Paris. All three locks are stamped and there is also a metal label on the inside of one of the drawers. 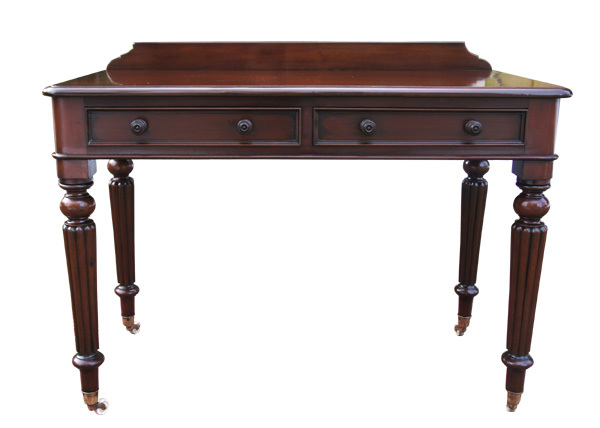 Thisantique Georgian library table or desk is made from the best quality figured mahogany timbers. 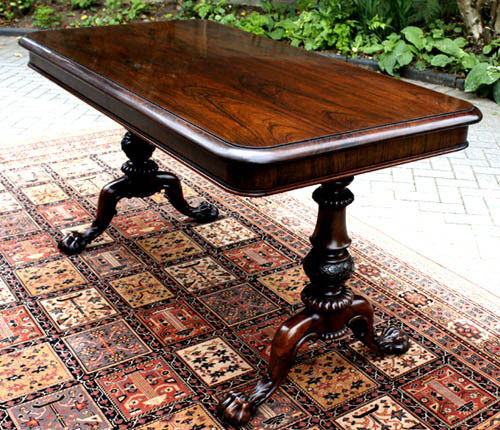 This is a rare antique George 111 mahogany library table in excellent condition with a beautiful patina. 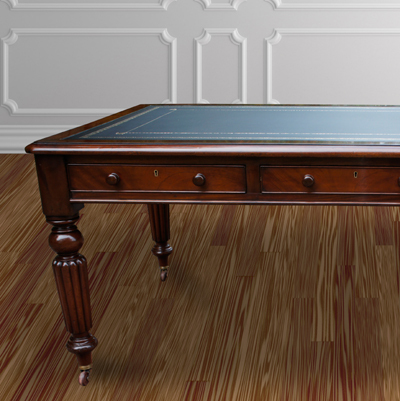 A handsome Gothic styled antique William 1V partners library table. Made from oak it has a lovely honey coloured patina. 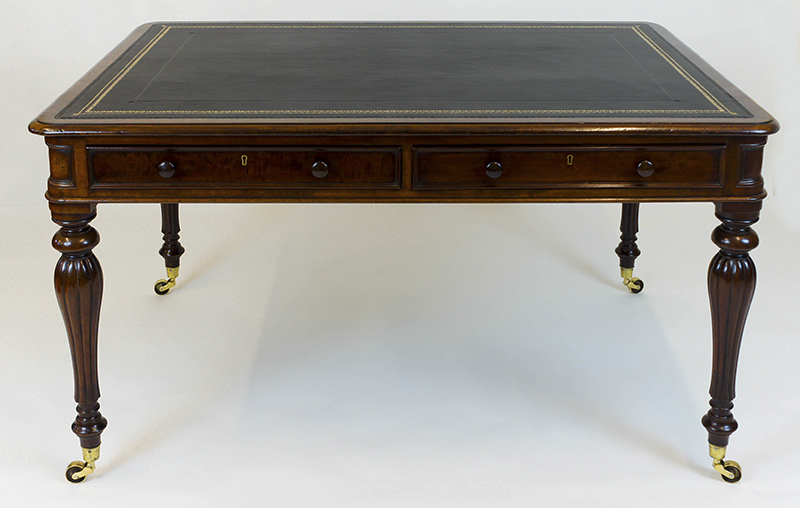 Recently benefitting from traditional restoration it has a new black hide writing surface with gilt and blind tooling.